Pipeline Integrity: Combining Coating Integrity and Cathodic Protection Surveys | Cath-Tech Cathodic Technologies Ltd. 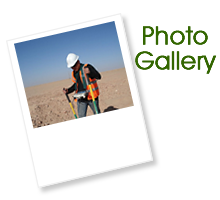 Many types of surveys are done to allow the operator to assess the condition of a pipeline. Two surveys are essential to any pipeline integrity management program, coating integrity and cathodic polarization. Coating integrity is investigated by generating a pulse on the pipeline, then walking the pipe to locate any voltage gradients in the soil. Cathodic polarization is obtained by performing an interrupted close interval survey and comparing the result with the criterion set by NACE. By combining both methods into one survey, the condition of the pipeline can be assessed and remediation planned with a higher degree of confidence than one survey alone. There are other benefits to combining surveys as both can be done at the same time by the same crew, saving the expense of performing two separate surveys. Pipelines have been used for centuries as a very efficient means of transporting liquid goods. Once installed underground, there is sometimes an assumption that it will last forever, out of sight and out of mind. Unfortunately for those people, pipelines do require monitoring and maintenance to ensure a long, safe operation. Most companies will monitor flow rate, product in the line and other operational parameters as these directly affect day to day operations and income. One area often overlooked is the condition of the pipe itself. Pipeline condition can be assessed both internally and externally. Internal options include pressure monitoring, corrosion coupons and inline inspection tools. Externally, the pipeline can be assessed with a number of different tools. External threats to the pipeline can be very hazardous to the operation of the line and to the area around it. There are numerous reports of leaking pipes in the ground. Sometimes the consequences are minor; a broken water-main will cause some flooding in a small area. However, when an oil or natural gas pipeline ruptures, there is a high potential for explosions, fire and casualties. The causes of these ruptures are varied; incorrect operational pressure, failed welds, third party damage and corrosion. These dangers can be minimized by having strong company policies and oversight in place. To prevent corrosion of the pipeline, a regular monitoring and maintenance program must be in place. Corrosion is an electrochemical process. There are two main methods of preventing corrosion. First, by coating the pipeline to create a barrier with the electrolyte (the soil), thus interfering with the chemical process. Second, by changing the electrical potential of the pipeline to prevent the corrosion reaction from occurring. The second method is called Cathodic Protection (CP). Above ground survey methods can be utilized to monitor the condition of the coating and the effectiveness of the CP. Where possible, digging up the pipeline should be avoided so as not to cause more physical damage to the pipeline coating. By using above ground surveys, a variety of information can be acquired regarding the condition of the protections on the pipeline and identify possible weak points for repairs. Two main methods are used to protect the pipeline; therefore both should be analyzed to obtain an accurate report of the condition of the pipeline. Coating integrity can be assessed with a variety of surveys. Some of these are Pearson Survey, AC Voltage Gradient (ACVG) and DC Voltage Gradient (DCVG). All of these work by creating a pulsed electrical signal on the pipeline. Then the surveyor walks above it with two electrodes and looks for changes in the electrical current flowing through the ground. Anywhere there is a local change in voltage at the same frequency as the signal generator, there is likely a defect in the coating. The surveyor then notes the location for further investigation. Assessing the level of CP on the pipeline is done with one type of survey, a Close Interval Potential Survey (CIPS). CIPS is accomplished by making a direct connection to the pipeline then measuring the polarized potential between the pipeline and an electrode on the ground. The voltage is recorded to compare with the CP criterion to ensure that adequate levels of CP are reaching the pipeline. These readings are repeated by the surveyor walking above the pipeline and recording the results. In order to obtain accurate results, it is necessary to measure the polarized potential of the pipeline. The most common method of obtaining this is by interrupting the CP source and reading the Instant Off potential of the pipe to the soil. Other methods include the use of corrosion coupons or digs. Instant Off readings can be taken at the soil surface. Temporarily removing the CP current from the ground removes the influence of that current from the reading. Ohm’s Law states that V=IR. The potential read by an electrode over the pipe is a sum of the voltage of the pipe (polarized potential), the voltage drops in the leads / meter and the voltage drops from the CP current travelling through the soil. Removing the CP current (I=0) eliminates the effect of the voltage drop from the CP system. In order to ensure accurate results, it is necessary to employ a very accurate method of time keeping. Current generation survey equipment utilizes the GPS system for precision timing. With all current interrupters and survey recorders GPS synchronized, the interruption and data recording can take place in the correct part of the cycle. Common survey cycles range from 3 seconds on and 1 second off to 800 ms on and 200 ms off. Beyond simply matching the timing of the survey cycle, the recording instrument must also wait for the appropriate moment to take the reading, a measurement delay. This is required because of the electrical side effect of pipeline coatings. When a coated pipe is buried in the ground, the coating creates a barrier. This provides protection to the pipe and prevents contact with the electrolyte (the soil). Electrically, it also acts as a barrier, essentially becoming a giant capacitor. On a well coated pipeline, it is possible to have erroneous data if the pipe potential measurement is taken too soon, while the capacitance or inductance created by the coating is still dissipating. 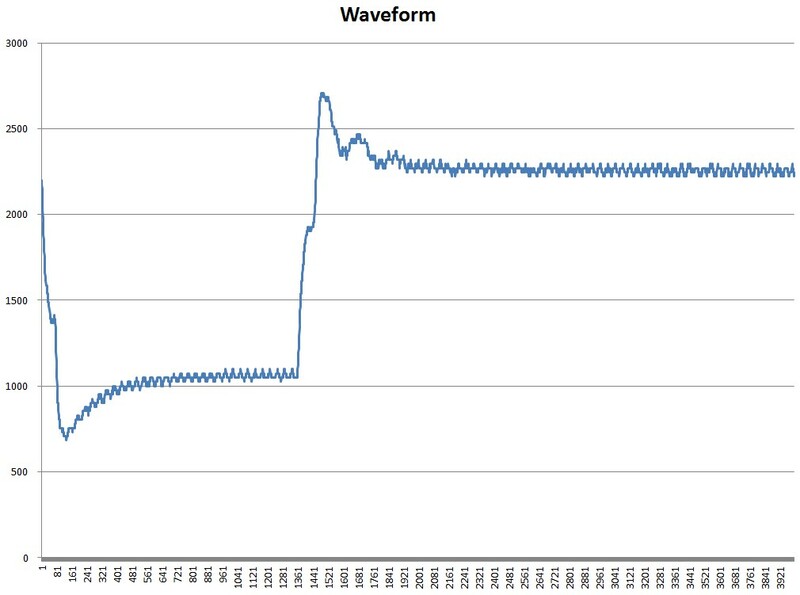 Utilizing an oscilloscope in any areas with coated pipe will show any effects, as seen in Figure 1, and assist with determining the appropriate measurement delay. The delay should be long enough to allow the pipe potential to settle, yet short enough that the pipe does not start to de-polarize. CP current is used to polarize the pipe, or shift the potential of the pipe in one direction. This occurs over a time period of days to months, depending on the pipe, coating, soil resistivity, etc. Polarization is easily measured electrically, but also has a chemical effect of changing the pH in the area. A polarized pipeline will develop a passivating film of higher pH on the surface of the pipeline. This high pH film is more electronegative than the original metal of the pipeline and will remain in place for a while after the current generating it stops. When measuring the pipe to soil potential, the desired outcome is to confirm the generation of this passivating film. As first suggested by Kuhn in 1933, a measurement of -850 mV polarized with respect to a copper-copper sulphate electrode is sufficient to reduce corrosion to a minimal level. This has been the basis of NACE standard SP0169 and is the international criterion for verifying CP levels. The surveyor obtains the polarized potential of the pipeline by interrupting the CP sources, as discussed earlier. On the other hand, coating integrity is evaluated by creating a pulse along the pipeline, then walking above with two electrodes and recording any variance is the voltage gradient. These surveys are done with one electrode on the pipe and the second off to the side or longitudinal on the pipeline. When the surveyor approaches a coating defect, a voltage difference will be observed by the two electrodes in synchronization with the signal pulse. The centre of the defect is detected when the maximum voltage gradient between the two electrodes is observed. AC or DC signal may be used to perform a gradient survey. One of the first coating surveys used in the field is the Pearson survey, which uses a high AC frequency and electrodes on the surveyor’s feet to generate an audible sound when a defect is approached. Locations of defects are marked in the field with stakes for later evaluation and possible excavation. By interrupting the CP sources to perform a CIPS, a DC pulse is generated along the pipeline. This pulse can also be utilized by a DCVG survey to inspect the coating integrity allowing the pipeline and survey team to gather two sets of data in one survey. Advantages of performing a combined survey include correlated data, survey done in same conditions and the expense of fielding one survey team instead of two. 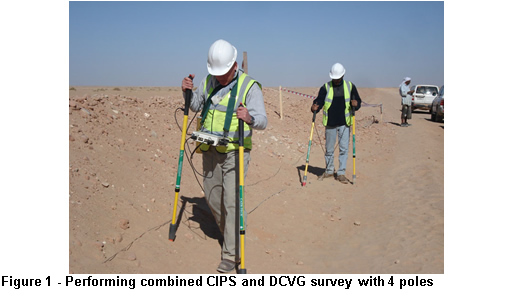 Figure 2 shows a pipeline survey crew using a four pole combined CIPS and DCVG survey method. Performing a combined survey gathers and records information about the CP level and the coating condition simultaneously. When the surveys are performed separately, there may be a challenge in matching the data afterwards. Additionally, using modern GPS synchronized survey gear allows the surveyor to also record the GPS co-ordinates of every reading. After the data is analyzed, the GPS recording will allow the dig team to re-locate potential problem areas quickly. There are some situations where a combined survey cannot be accomplished. Primarily this is when there is not enough IR drop to obtain valid DCVG readings. For valid DCVG readings, an IR drop of 200-300 mV is desired. When there is very little difference between the on and off potentials, such as in low resistivity soils, it becomes necessary to add additional strength to the DC signal to perform the survey. This can be accomplished by increasing the output of the CP rectifiers and/or adding additional temporary rectifiers. Adding additional DC current will affect the polarization of the pipeline and render any CP related data unusable. Fortunately, most pipelines have sufficient IR drop to allow combined surveys. The combined survey is also of financial benefit to the pipeline as the survey team must only survey the area once to obtain two sets of data. 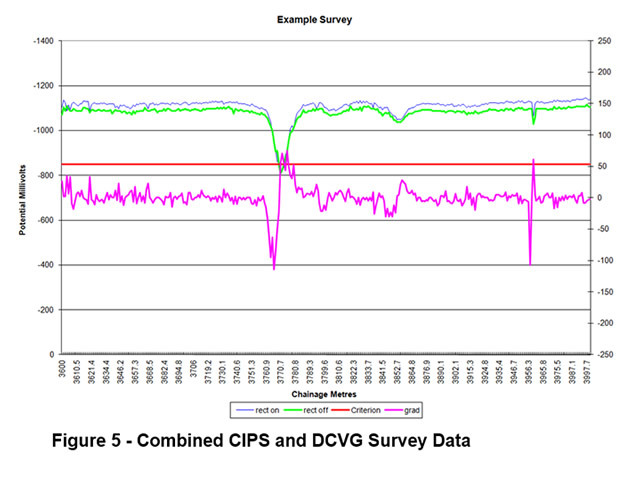 Figure 3 provides some CIPS data, while Figure 4 provides some DCVG data. Combined survey results are shown in Figure 5. Note that in Figure 5 there are 3 apparent areas of concern. Only the left one is of high priority for remediation as the data shows a coating defect with inadequate levels of CP. The other two areas have possible coating defects, but are well protected by the CP. It is important to remember that while CIPS and DCVG are complementary surveys and can be performed together, they are measuring two very different things. CIPS is used to evaluate the level of CP along the pipeline and ensure it meets the international criterion of -850 mV. DCVG is used to evaluate the integrity of the coating and identify areas of coating defects. Both of these surveys provide valuable information to the pipeline operator, allowing them to make informed decisions on the condition of the pipeline. The information can be combined with other available data, such as; in line inspection, soil resistivity, leak history, etc. to prioritize repair work and ensure that the pipeline is unlikely to leak. For example, an area with a large coating defect, adequate CP and no other risk factors is a low repair priority compared to an area near a school with inadequate CP and a small coating defect. Remember that coatings and CP are complimentary methods of preventing corrosion, where one is weak, the other will work. It is in areas where both are weak that is of most concern. Table 1 provides some guidelines for prioritizing remedial work based on the combined CIPS and DCVG survey data. The pipeline operator needs to ensure that the pipeline in the ground is sound and unlikely to develop a leak, which can lead to explosions, loss of life and large environmental damage. CP and coatings are used together to prevent corrosion of the steel. Both require monitoring to ensure adequate protection levels. This can be done on a regular basis by performing CIPS and voltage gradient surveys, as is recommended in NACE SP0502, External Corrosion Direct Assessment. This information can be gathered by performing two separate surveys or by performing one combined CIPS and DCVG survey. The data obtained can then be easily analyzed and areas of concern prioritized for effective deployment of remediation and repair crews. The combined survey data will show that the pipeline has been inspected and, if the results are good, is proven to be protected from external corrosion. In the event of a future leak or rupture, it will be due to other causes. For the safety and longevity of underground pipelines, combined surveys are part of a proven comprehensive program to prevent external corrosion.